I’m a problem-solver by nature — as soon as I’m confronted by an issue, my brain immediately rounds up the metaphorical troops and puts all available energy into finding a solution. Often this leads to creative solutions or hare-brained inventions, but occasionally I zoom right past the main issue and solve the wrong problem entirely. We had been invited out to a birthday party, where (as usual) I ate far too much and then topped off my excesses with a couple of delicious beers. Hubby reacted not at all, neither to the original gross breach of etiquette nor to my subsequent lip service to politeness. 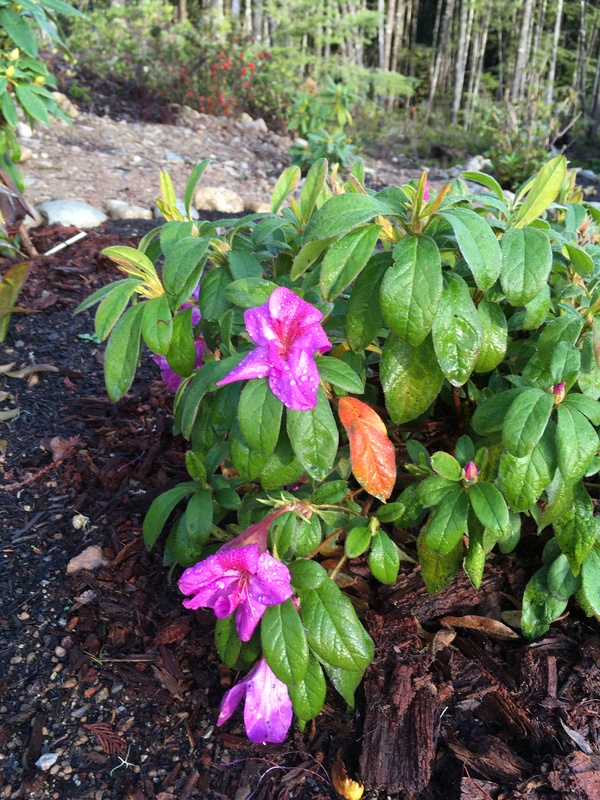 It’s hard to believe, but one of our azaleas is still blooming! This is “Bloom-a-thon Lavender”, still putting out flowers at the end of November. 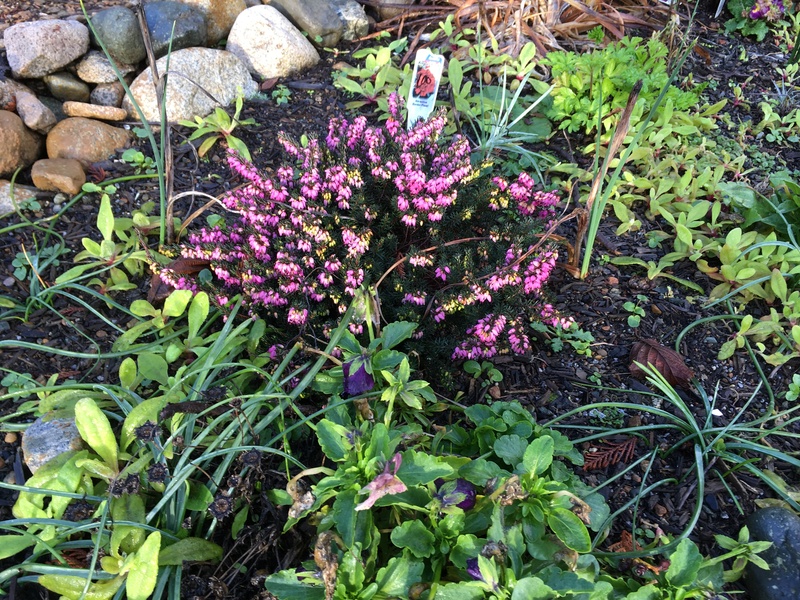 The heather is already in bloom, and the pansies haven’t stopped since I put them in last spring. 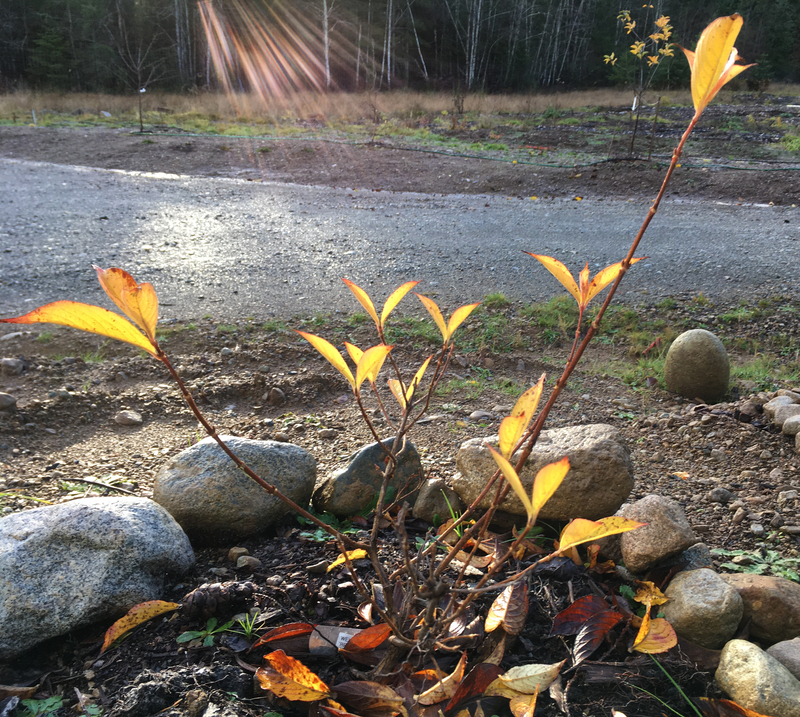 The last few leaves of the weigela perch like bright butterflies on the tips of the twigs. 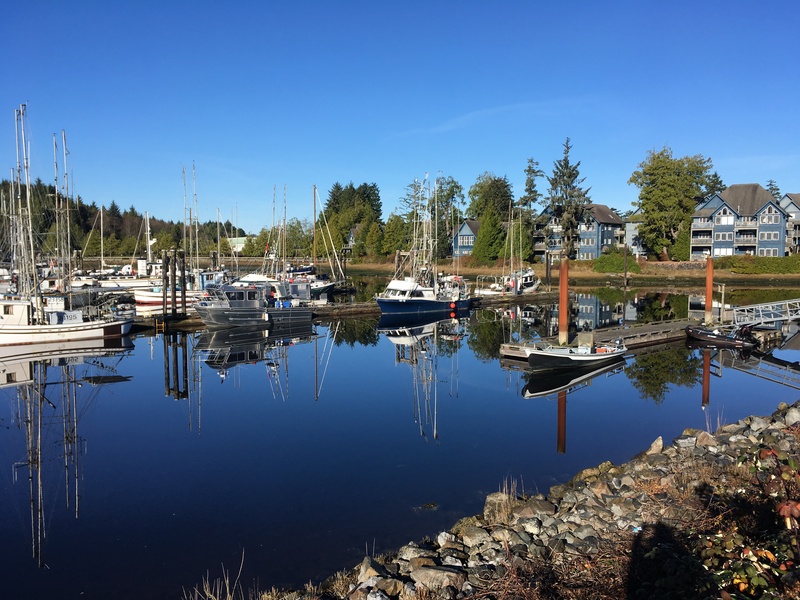 We took a trip out to Ucluelet (on the west coast of Vancouver Island) a couple of weeks ago, on a gorgeous calm sunny day. 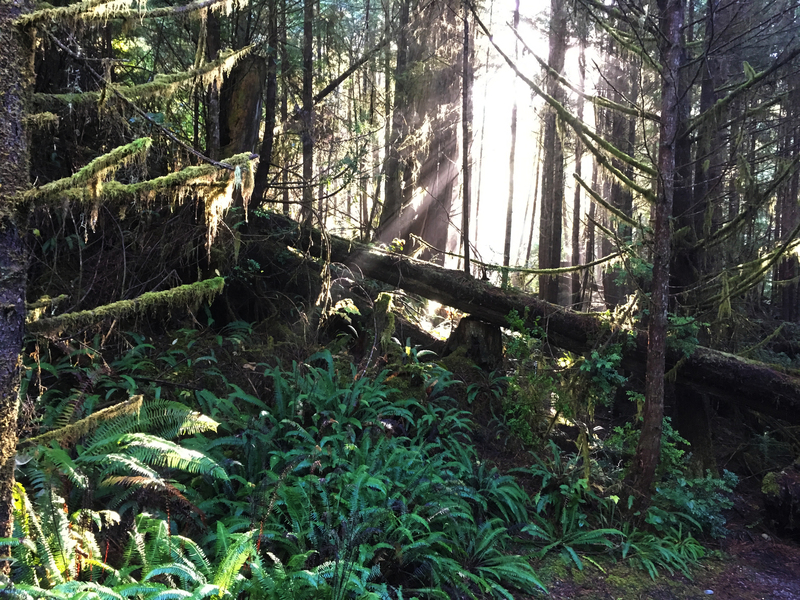 It wouldn’t be the West Coast without some gorgeous greens! May all your problems be easily solved! Book 14 update: Despite a busy week, I made it almost to the end of Chapter 34. All the threads are coming together now! Last week’s post reminded me that I’m no stranger to flying food. In fact, it may have contributed to my lifelong antipathy toward dressing up and attending formal functions. First, a bit of background: I grew up on a farm ‘way out in the sticks. We dressed up for church, weddings, and funerals, and the rest of the time I ran wild outside. So dress-up occasions came with considerable tension and discomfort: “Don’t do anything to get your good clothes dirty” meant ignoring my most fundamental personality traits. When I was a teenager, my cousin’s wedding reception was held in the Fort Garry Hotel, the grandest historic hotel in Winnipeg. There was a buffet, and I was on my best behaviour in my best dress. We were working our way through the buffet line and my dad was ahead of me, chatting to whoever was ahead of him. Remember the restaurant scene in Pretty Woman where the snail shoots off her plate only to be fielded by a deadpan waiter? Yep, you guessed it. Not versed in buffet etiquette, I had just taken a piece of pineapple with my fingers. As I moved the slippery morsel toward my plate, my dad gestured animatedly. (Apparently it runs in the family.) His hand smacked mine, and the pineapple sailed across the fancy ballroom to disappear under one of the white-skirted tables. I envied it at that moment. I felt like vanishing under one of the tables, too. Fast-forward to my first year of living in residence at the University of Manitoba. Thanks to Chris K., a mature student who took this wide-eyed country bumpkin under his (platonic) wing, I finally learned some basic table manners such as holding my fork between my fingers instead of clenched in my fist like a weapon. My image makeover continued while I observed and copied the fashion choices of my oh-so-sophisticated interior design classmates. By the time I went on my first date (!) to a fancy restaurant (The Keg – hey, it was a whole lot fancier than anywhere I’d ever been), I was prepared. I wore fashionable clothes; I knew how to hold my fork; I even successfully identified the bread-and-butter plate. It was winter, so I was wearing my best (okay, my only) full-length coat. Dinner went without a hitch and the bill was uneventfully paid. 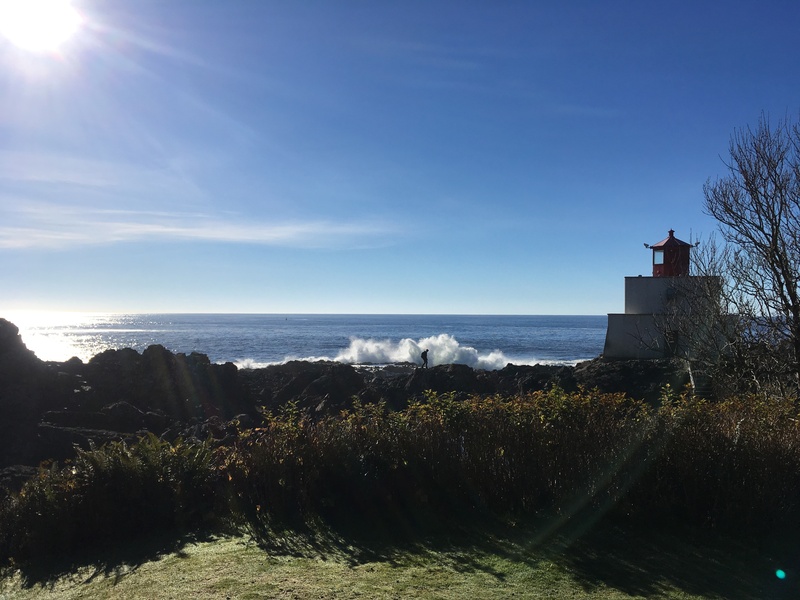 When we finally rose from the table I turned to leave, swinging my coat dramatically over my shoulders… and it caught a full pitcher of ice water on a nearby ledge. I didn’t look back to see whether it had landed on the floor or the neighbouring diners. Head high, I swept out of the restaurant in my dramatic coat, the clattering of ice cubes and cries of dismay fading behind me. It was a long time before I felt even remotely comfortable in a nice restaurant. And I’m still VERY careful when donning my outerwear near other diners. Anybody else have food-flinging tendencies? (Remember the snail scene from Pretty Woman? It runs from 1:50 to 2:35 in the video).